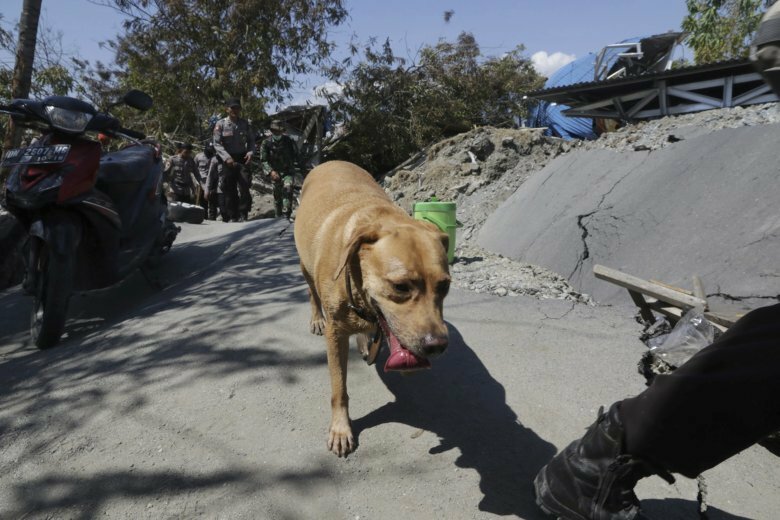 PALU, Indonesia (AP) — For two days, Edi Setiawan helped pull the dead and the living out of a sea of mud and debris, all of them victims of one of Indonesia’s deadliest earthquakes in years. Friday’s magnitude 7.5 quake killed more than 840 people and destroyed thousands of homes, triggering a humanitarian crisis with survivors now in desperate need of food, water and fuel. Disaster agency spokesman Sutopo Purwo Nugroho said Palu’s Petobo neighborhood, where Setiawan lived, was especially hard-hit. “There are still hundreds of victims buried in mud” in the area, he said. Palu, a city of 380,000 on the western coast of central Indonesia’s Sulawesi island, stood in ruins. Toppled cellphone towers have cut off communications, while downed power lines leave the city in darkness after the sun sets. When the massive quake struck on Friday, Setiawan said he was cleaning debris from another strong tremor that had cracked the walls of his home just hours earlier but left it standing. He tried to reach his parents’ home, about 300 meters (yards) away, but the sea of mud that engulfed the area made it too hard to reach. With other villagers, he turned to saving whoever he could. “I took a 2-year-old (child) on my head, a 3-year-old on my back, and held a 5-year-old while struggling to swim out from mud to the asphalt road,” Setiawan said. Then they turned to the dead, recovering four bodies. It was Saturday when Setiawan saw the bodies of his father and sister in the sludge, locked in the embrace that had marked the last moment of their lives. Setiawan said the first government rescue teams arrived in his area Sunday, but because the mud was still unstable, they were only able to take photos documenting the tragic scene. This story has been corrected to with the man’s name spelled Setiawan, not Setiwan.